More than a decade after Andre met an unfortunate end (two ends technically) from a teleportation accident, his son Phillipe (Brett Halsey) is eager to begin his father's experiments again. His uncle, Francois (Vincent Price) initially balks, but eventually decides to help, deciding he'd better keep an eye on Phillipe. Phillipe's partner Alan (David Frankham) turns out to be an industrial spy eager to sell the teleportation technology to the highest bidder. One night, Phillipe catches Alan stealing secrets and after a brief fight, Alan knocks Phillipe out and tosses him in a teleport booth along with a common house fly. 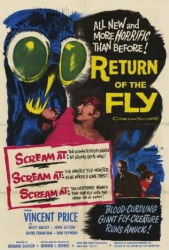 The first thing you will notice about Return of the Fly is that the gorgeous color of The Fly (1958) is missing. Originally, Return was shot for television. The black and white cinematography is serviceable enough but it definitely feels like a step down. Gone also, is the slow descent into tragedy, now replaced with a much broader and fast paced crime story. Essentially Return of the Fly is a revenge film. The result is a much lighter story that is more interested in the monster than the man. In many respects it shares a lot more with the remake sequel, The Fly II (1989), than I expected. Retaining only one actor, removing most of the other characters, and changing location creates a distinct divide from the first film, and I think it's a good step. This film is much more interested in presenting a world that could have come from an EC Comic, complete with strange deaths, and nefarious gangsters on the wrong end of a disgusting monster. The quiet refinement of the Montreal setting would have been at odds with all that. Since Phillipe is doing a lot more running around than his father, it necessitated a studier and much larger fly head be built for this film. The actual reason for it is hand waved away as the result of a gigantism side effect from teleportation. The actual prop is detailed, but it's size and relative stiffness make it more silly than menacing. However, it does fit in well with the much more over the top atmosphere of Return of the Fly. There are a few eerily effective moments in Return of the Fly, perhaps the most infamous is the human handed guinea pig created when Alan throws a dead police inspector and a live animal together in a teleporter booth. We're treated to a hairy faced corpse, and a little monster that is gruesomely crushed underfoot. Return of the Fly has none of artfulness of its predecessor, but taken on its own, it is a solid low budget monster film. It manages to entertain, if not necessarily impress. It maintains a macabre playfulness that results in a relatively shallow but much more kinetic film. Return of the Fly never made the impact that The Fly did, but then again it was never meant to do so.